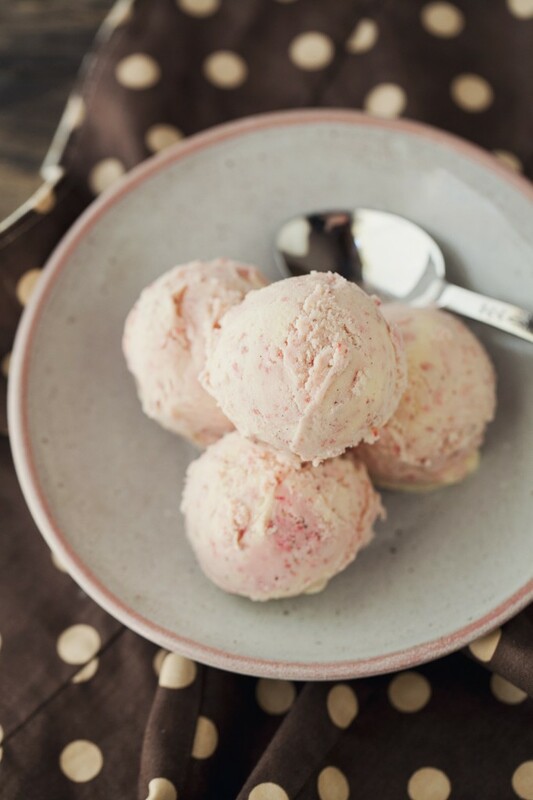 When one buys a flat of strawberries on a whim, it seems almost inevitable that one would make ice cream from said strawberries. 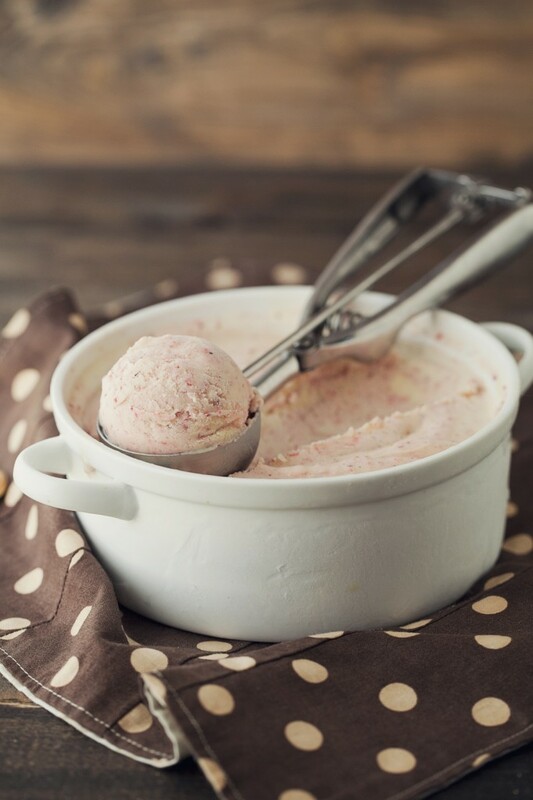 I know that strawberry season is almost over but If I could convince you of one thing today, it would be to only make ice cream from freshly picked berries. Store bought strawberries do not have the flavor and the juiciness of local strawberries. Seriously, two cups of fresh strawberries in this ice cream, paired with local dairy, and one powerful vanilla bean means you have one amazing bowl of ice cream. All I want is this ice cream, a good book, and a hammock. That’s summer, right there. Obviously if strawberry season is over for you, other berries would work just fine. The 90˚ weather in Illinois has left me wanting ice cream every day, possibly even twice, no matter the flavor. 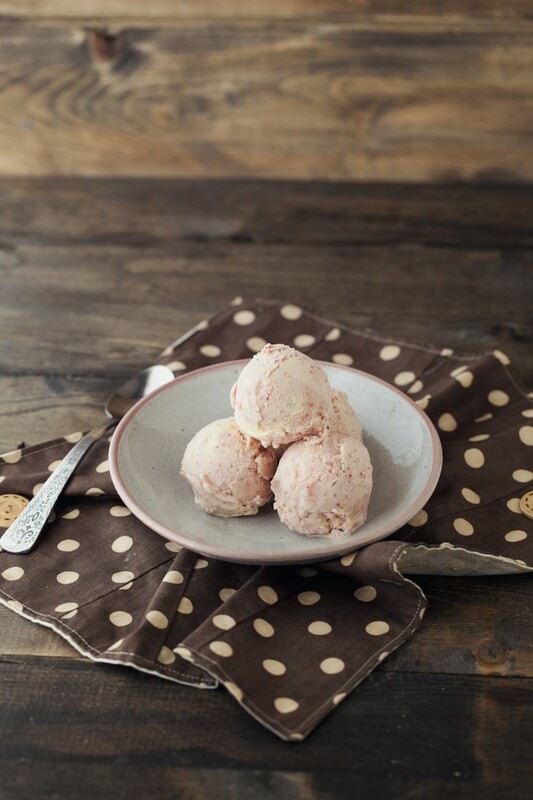 However, if you manage to snag a few strawberries, I suggest you throw them in this ice cream. Have a fantastic first official weekend of summer! Hull strawberries and place in a food processor. Pulse until strawberries have smoothed out. Slice the vanilla bean in half and scrape in to a medium pot. Add in heavy cream, milk, and turn on heat to medium. Bring milk to just before it starts to boil and forms bubbles around the edge. In a separate bowl, whisk together egg yolks and sugar until mixture is lighten in color. While whisking constantly, stream about a 1/4 cup a cup of the heated milk mixture in to the egg mixture. Continue to pour milk while whisking. Add contents back to the pot and cook until mixture becomes thick and coats the back of a wooden spoon. From here, let cool completely in the refrigerator. Next, freeze according to machine’s instructions or you or check out this post that has helpful hints on what to do without a machine. When ice cream has thickened, remove half from the ice cream machine and set aside in freezer. Pour in strawberries and continue to run machine until strawberries have blended. Pour into vanilla portion and swirl. Freeze until hard. This is summer in a bowl isn’t it? Just gorgeous. Oh, man. You make ice cream look so good. your ice cream looks wonderful erin! i have never attempted making ice cream from scratch before and this makes me want to invest in an ice cream maker. i’m a little confused about direction number 5. not quite sure where you mentioned putting the mixture into an ice cream machine? also, would you have any recommendations on what to do if i don’t have an ice cream maker? Updated to make it a bit more clear and I linked to David Lebovitz’s instructions on how to freeze without a machine! Mmm pure deliciousness! Love it! 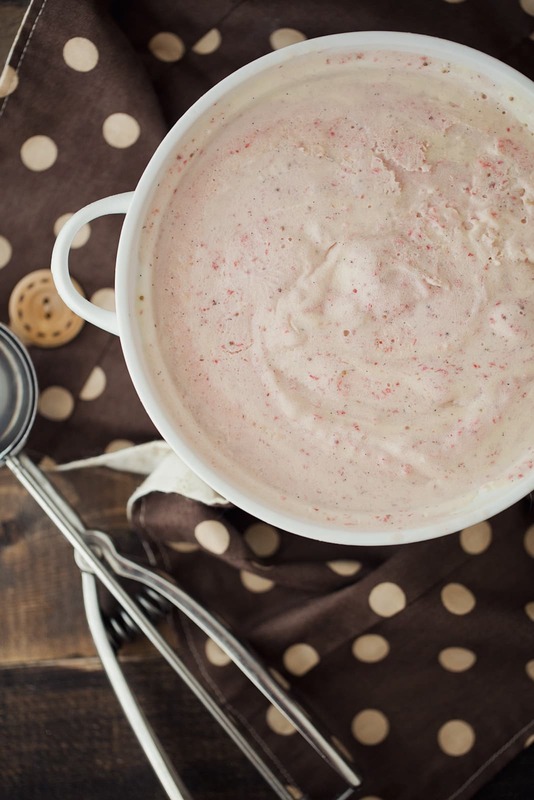 Homemade ice cream is one of my favorite parts of summer! This is such a pretty one. Totally gorgeous. Thanks for this recipe. Luckily (as it were) we had a super crappy spring in my corner of the world, so the local strawberries have only just started. Thanks for posting this recipe, I’ll definitely be trying it out! I always seem to get ice crystals in my finished product leaving the texture less than creamy? I chill the custard completely before freezing. Any suggestions? That usually comes from the type of dairy. I’ve had that problem before when I’ve used skim milk, etc. I’ve also found that using non-homogenized milk also helps sometimes.